WASHINGTON (CNN) -- A suspect in the 2000 bombing of the USS Cole in Yemen said he was tortured into admitting responsibility for that attack and others, according to a hearing transcript the Pentagon released Friday. Abd al Rahim Hussein Mohammed al Nashiri, a Saudi Arabian detainee held by the United States at Guantanamo Bay, Cuba, denied participating in the Cole attack. Al Nashiri said he "was tortured into confession, and once he made a confession his captors were happy and they stopped questioning him," according to a statement read at his hearing. "Also, the detainee states that he made up stories during the torture in order to get [it] to stop." Pentagon spokesman Bryan Whitman said the Defense Department would investigate al Nashiri's torture allegation if the military was holding him at the time. If another agency was detaining him then, Whitman said that agency would be responsible for the investigation. The transcript was the ninth the Pentagon has released since the combatant status review tribunals began this month for 14 detainees whom the CIA once secretly held. The hearings will determine whether a detainee should be classified as an "enemy combatant." If so, they then can be charged and tried under the military commissions law that President Bush signed in October. Suicide bombers on a boat attacked the guided missile destroyer USS Cole on October 12, 2000, in the harbor at Aden, Yemen. Seventeen U.S. sailors were killed and 39 injured. The U.S. military's summary of evidence against al Nashiri said an FBI source identified him as an important person in al Qaeda and "heard" he helped arrange the Cole bombing. The evidence said al Nashiri bought a boat and explosives used in the Cole attack with his own money. Al Nashiri said he is not a member of al Qaeda, according to the transcript. However, he said he knew those who bombed the Cole because he had business dealings with them in the fishing industry. "He did not even hear about the USS Cole bombing until many hours after it had occurred and was surprised by the incident," according to the transcript. Eight other review hearings have occurred for the 14 labeled as "high-value" detainees, including one for the suspected mastermind of the 9/11 attacks, Khalid Sheikh Mohammed. Mohammed told a military panel he was responsible for those attacks and more than 30 others, according to a transcript released by U.S. military officials. 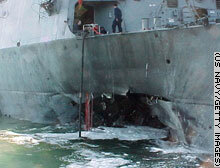 Seventeen sailors were killed when attackers blew a large hole in the hull of the USS Cole in Aden, Yemen, in 2000.